In the wake of the North American tour’s stellar reviews and added concerts, Katy Perry announces the Asia leg of WITNESS: The Tour.Produced by AEG Presents and Ovation Productions, Katy Perry will visit Manila on 02 April 2018 at the Mall Of Asia Arena. 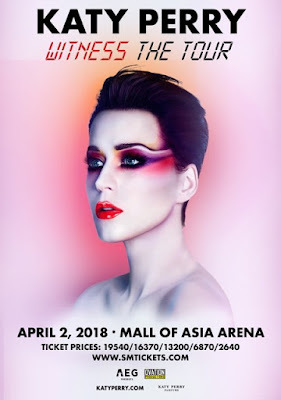 Besides Manila, WITNESS: The Tour Asia leg also includes Tokyo, Hong Kong, Taipei, Singapore, Bangkok and Jakarta. This announcement follows the addition of a South American leg in March, Mexico, UK and European legs kicking off in May of 2018, and an Australian/New Zealand leg commencing in July of 2018. With Witness, Katy finds liberation, in the changes in her own life and in the world around her, delivering songs that inspire both thought and movement. The singles released thus far – the Platinum-certified “Chained to the Rhythm” featuring Skip Marley, and the singles, “Bon Appétit”featuring Migos and “Swish Swish” featuring Nicki Minaj – hint at the breadth of the musical and thematic elements found on Witness. WITNESS: The Tour is Katy’s first run since the sold-out, 151-date Prismatic World Tour, which concluded in 2015 and was hailed byRolling Stone as "a show to damage retinas and blow minds." Sponsors include KATY PERRY PARFUMS.